Hey there! Thanks for dropping by Love Resembles Food! Take a look around and grab the RSS feed to stay updated. See you around! There’s been some dangerous experimentation happening in our house. For a week, all food prepared within the confines of our apartment has been… vegetarian. I’ve been hoping to find a couple new, healthy recipes to incorporate into our regular repertoire, and figured a week of just veggie cuisine was a good way to push our borders. 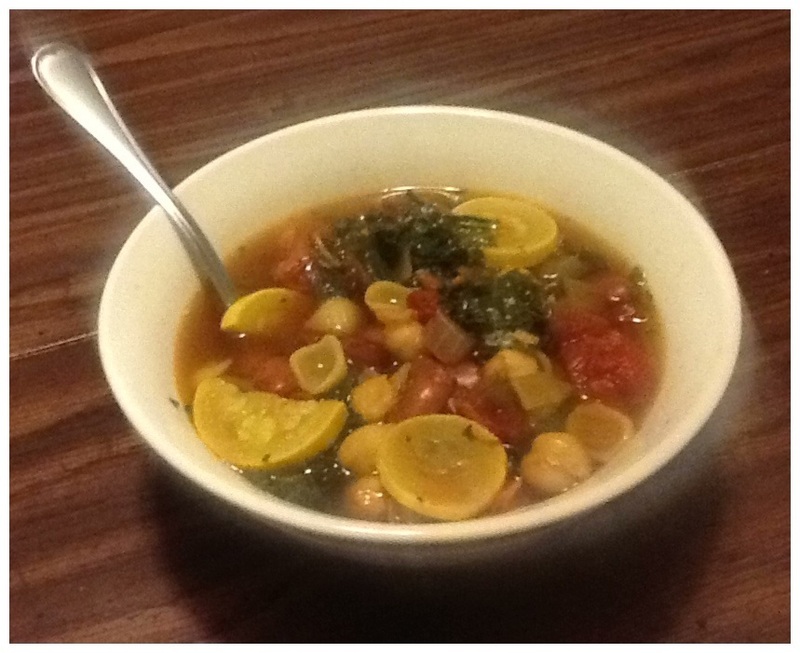 The experiment had mixed results, but one definite new favorite that came out of it is a chickpea and kale minestrone. Unfortunately, it’s also been a week of head-cold-and-umlaut-inducingly BR Ü TAL winter weather. Seriously, a couple days ago I was digging out our cars from 14″ of snow, and at this moment there is thunder and lightning. But then, this weekend is supposed to be Ragnarök, so I guess that makes sense. Anyway, I’ve got a nasty sore throat and sinus situation emerging, and decided to make another batch! It’s fairly fast, easy, and mad packed with nutramites to fortify your X-zone! In a large pot, sweat onions and garlic in oil until translucent. Add in vegetable broth, beans, chickpeas, tomatoes, carrots, zucchini, kale, and seasonings. Bring to a boil, then drop heat to simmer for 20 minutes. Add pasta, and cook 10 more minutes, or until shells are cooked through. Stay warm and safe, folks! That looks great! Veggie soups are so versatile!